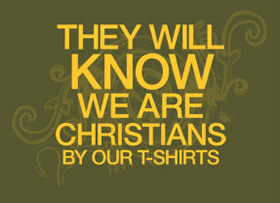 There’s this t-shirt out there that says “They Will Know We Are Christians by our T-shirts.” Which is kinda funny, and kinda sad. They will know we are Christians by our…Righteous Deeds…oh wait. What’s interesting to me is who Jesus is talking to. The context here is everything. The group Jesus is talking to are His disciples in the upper room. Many people have looked at this verse and this phrase and have said that the world will know we are His disciples if we love. And so Christians focus on loving the world, which is good! But loving the world and everyone in it is already a given if you’re a follower of Christ. The context is right in the passage itself: Jesus is referring to people who follow Him, loving other people who follow Him. Jesus says, “Your love for one another will prove to the world that you are my disciples.” It’s already a given that we are to love the world and everyone in it. But it is an entirely different thing to love each other. Let me explain. Right now in many churches and denominations we have so much fighting and dissention. In fact, it’s not just in religion, it’s in politics as well! Just recently after the election in the United States, there was talk of secession because certain voters in certain states felt that they could not belong to the United States of America because their political party looked like it had lost. In some churches and denominations right now there is huge infighting based on discussions regarding gender roles, worship style, homosexuality, unity, and the list could go on and on. That’s why we have over 35,000 denominations within the Christian faith today. Because we have never learned to disagree well. Dare I say, we’ve never learned to love. The other interesting thing about the context of this verse is that Jesus has just washed the disciple’s feet at the last supper. This is a tradition we do in the Adventist church to show humility and love to one another, and to remind each other that the only One lifted up higher than any of us is Jesus Christ. That my opinion is not higher. My stance on a certain issue is not higher. But that we are all under Christ and therefore brothers and sisters. We are family. And notice also that Jesus calls it a “new commandment.” It looks like He knew it would be a difficult thing to do. He needed to show us that this is not a small issue to Him. This is big enough to make it a commandment. It’s as if He knew we would get our focus on nit-picking others and pointing fingers and fighting to be right, and we would forget how to love. Once again, most people apply this to the “world” versus “followers of Christ”. But what if Jesus was also referring to those within the walls of Christendom? What if my “enemy” is the one who disagrees with me and is persecuting me because of our differences? 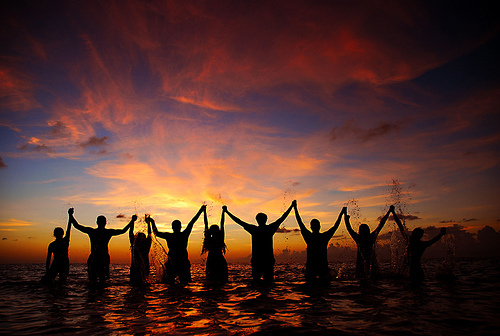 It’s so easy to love and commune with those who agree with us and think the same way we do. But what about those who don’t? It looks like God wants us to learn how to listen to others and extend grace to each other, especially those we don’t agree with. It appears from these passages that God desires us to love others, and especially each other. Especially those with whom we find it so difficult to like. Because in all reality, when the world sees a group of people who love and respect each other, even in the midst of disagreeing, there is something divine about that. Because it is not human. It has to come from a greater source. This will prove, not only that we are His disciples, but it will also prove that perhaps a God of Love actually exists. Thank you for writing this. I’m having a major crisis of faith with all the hate being spouted by those who claims to follow Christ.